Kimchi Chow, a/k/a “The First Asian Coach for Asian American Women in USA”, was born and raised in Vietnam, and was greatly influenced by her mother as a businesswoman and working mother. When Vietnam fell to a Communist regime, Kimchi and her family fled to the United States. Her parents worked incredibly hard to build a life in the states for their 9 children, working long hours for minimum wage. She learned early on that working hard can build a better life for herself and her family, and that money and/or authority are necessary to create power. Home life was hard, with her father harshly criticizing and telling them they were dirty, useless and stupid. Disrespect of her mother by him was difficult to watch. Kimchi graduated from college with a B.S. Degree in Computer Science. After 20 years in the high tech industry, Kimchi quit her job. She joined a Buddhist study group for a year, allowing her to take courses in communication, relationships, partnerships and personalities. She also invested in many self-help workshops and used this time to begin to begin to discover herself. Kimchi has owned & run several different businesses: a Janitorial Service franchise, Real Estate Investing, Private Money Lending, and Property Management. She learned to trade stocks & currencies to manage her own retirement fund. She is a certified Law of Attraction Life Coach, and a certified B.A.N.K. Trainer. Today, Kimchi works with Asian professional women to empower them to create a life they love. As host of “Asian Women of Power” Podcast, she shares insights on life lessons she has learned from the past four decades living as an immigrant in the USA, as well as tips from other Asian women and immigrants who overcame the challenges of cultural conflicts and how to find the key to claim power in life. She lives in San Jose, California with her husband, and is active in the Asian American business community. 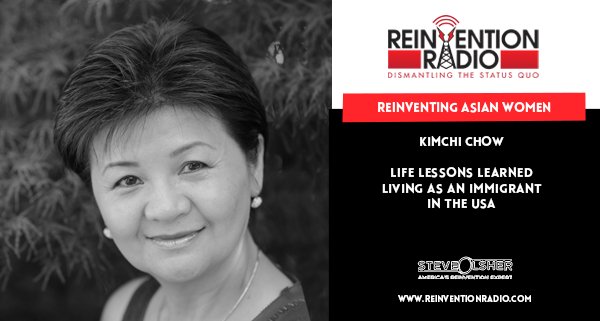 Tune in to hear Kimchi chat with Steve, Mary, and Richard about her life in Vietnam, her family’s escape to the United States and what she has learned over four decades living as an immigrant. Boat people have the most courageous minds — none of them could swim! She learned to speak English, got an engineering degree, and went to work. Reinventing Intimacy – In this episode, tune in to hear Allana Pratt chat with Steve, Mary, and Richard about her method of helping people feel free to be unapologetically themselves – no longer trying to get approval or fearing rejection. It was my honor to be on this radio show. I hope my story will empower other Asian women to step up and stand out and live their life out loud. We loved hearing your story Kimchi! You’re an amazing women and will do wonders with your Asian Women of Power movement.